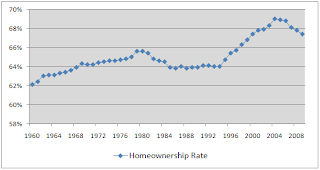 What Is the "Right" Percent of the Population Who Should Own Their Own Home? The Current Ownership Rate Is the Lowest in 18 Years. Time to Panic? Every president since FDR, at least, has attempted to stimulate home ownership in the US. There can be little doubt that this emphasis on the positive aspects of owning a piece of America has benefited many individuals and families. Note that there are those who think the huge emphasis is misplaced, and that families should not necessarily place such a huge percentage of their assets in one investment, most think property is a excellent hedge, providing good returns, and generating many side benefits. But after reaching historic highs of 69% in the first decade of the 21st Century, the bubble burst and we now find ownership rates to have returned to the norm of around 65% that has been in place of at least three decades. The government is all in a tizzy at this point attempting to provide ways to turn around the falling rate of ownership, and not reinflate the bubble. Most of the discussion turns around the issue of how tight or loose to make regulations around mortgage qualifications. Ease the qualifications, and send ownership rates higher, but also create increased demand on limited supply, thus driving up prices. . . bubble. Tighten regulations to reduce risks to mortgage holders and the banks and insurers, and you risk driving out potential solid buyers, thus lowering demand and hurting the housing market. Interestingly the percent of white home ownership tends to be around 6% higher than the overall rate. There could be an argument that the "right" rate would be the white rate. If 70% ownership among whites was sustainable over that 30 years, at least a good goal might be to do that for the entire population. Two excellent articles on the subject have recently appeared in Bloomberg and in US News. These articles delve more deeply into the pros and cons of the overall social policy and the government's role in that policy. In California home ownership has been a remarkable vehicle to wealth for many. There are few areas of the country that are more likely to maintain value and offer the opportunity for appreciation that Los Angeles and Orange County. If you are interested in purchasing a home for your family or for investment and you need the services of a mortgage professional to help you find the best possible mortgage product to help you secure that dream, please give us a call. We are now a part of Guaranteed Rate, and have resources that can help you find a perfect mortgage for your needs.